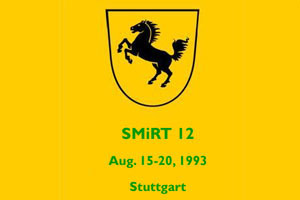 The University of Stuttgart is the host organization for th SMiRT 12 Conference. It will be held under cosponsorship of German organizations involved in the nuclear power technology; scientific support will be provided by the European Division of IASMiRT. An Organizing Committee consisting of experts from various fields was formed to assist the chairman in scientific, organizational and financial matters. A Senior Advisory Committee is also assembled, whose members can be called upon, as needed, to provide counsel and guidance to the Organizing Committee on a host of diverse technical and organizational matters. The Executive Committee is the executive body responsible for organization matters, technical program development, publishing of the proceedings, support services and the financing of the Conference. SMiRT Conferences have finally chieved complete self-reliance and self-sufficiency. Many members of the Executive Committee have actively participated in previous SMiRT Conferences, and in addition to their long-standing familiarity with SMiRT traditions, they bring to the Conference organization their extensive technical and managerial skills.